ModAttire hold a premium position in the market since from the year 2009 and manufacture, export and supply best & cost effective range of Embroidered Products in multiple designer styles. Additionally, we provide qualitative assortment of Hand Embroidered Fabrics, Beaded Embroidery Work and Haute Couture Embroidery. 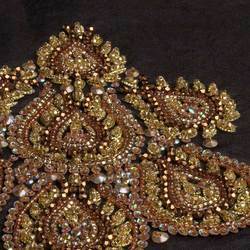 As a reputed service provider of embroidery market, we have marked a special niche in the marketplace by offering remarkable services of custom hand embroidery work. Also, we have export base in international markets and we consistently provider qualitative products & services to our clients based all round the globe. To bring forth top quality product range in the market we have maintained a well-equipped infrastructure that give us ease to produce in bulk quantities. We are supported by our team of expert professionals that work hard round the clock to complete the given orders on time. In addition to, our ethical business policies are made by us for the ease of business that we want to provide our clients. The finally prepared ranges of embroidered products are packed safely in the tamper-proof packaging. We deliver these products to the clients end in the given time frame without making delays in the services. All the production activities & processing is done under the guidance of experts that hold years of experience in the domain. For us, our clients are our top priority and we always strive to provide best quality products in the promised time frame. We sincerely pay our thanks to Mr. Ravi Gupta who secures excellent experience in the domain and serving from many years in the domain of embroidered products. He gives special emphasis to the customer’s demand and always try to deliver total quality solution in our product range. Evidence is available that India is its Original Home, Therefore it will Not be improper to say that hand-embroidery is as old as civilization of India, The earliest Indian needles were excavated at Mohenjadaro and can be dated to Circa 2000 BC. The Vedas contains numerous reference to needle work in Vedic literature , Embroidered garment are termed as ‘pesas’ and ‘pesaskari’ means a Women embroider. In the 16th century, in the reign of the Mughal Emperor Akbar, his chronicler Abu al-Fazl ibn Mubarak wrote in the famous Ain-i-Akbari: "His majesty (Akbar) pays much attention to various stuffs; hence Irani, Ottoman, and Mongolian articles of wear are in much abundance especially textiles embroidered in the patterns of Nakshi, Saadi, Chikhan, Ari,Zardozi, Wasli, Gota and Kohra. The imperial workshops in the towns of Lahore, Agra, Fatehpur and Ahmadabad turn out many masterpieces of workmanship in fabrics, and the figures and patterns, knots and variety of fashions which now prevail astonish even the most experienced travelers. Taste for fine material has since become general, and the drapery of embroidered fabrics used at feasts surpasses every description. Elaborately embroidered clothing, religious objects, and household items have been a mark of wealth and Status. Our team consist experienced and well educated professionals from the clothing industry. They all know well how to execute the work in an excellent manner without less supervision. Additionally, at the time of recruitment process we check their skills and knowledge of the domain. We also judge their capability to handle the tough situation and dedication towards work. They all are experts of domain but on timely basis we conduct training sessions for them so that they remain update with the latest market trends. We are the primary choice of our customer’s that wants to purchase attractive and flawless range of embroidery products. Our products are excellent in quality, design and fabric. Apart this, we work as per the exact needs of our client’s to achieve their full satisfaction. We are also known for ethical business transactions & trustworthy business deals. In the similar way, with clients can choose to make payment through cash or by cheque, both payment modes are acceptable by us. We have been present in the market since 6 years, from the starting of our business we are known to provide high quality embroidery products & clothing. We are sincere towards quality norms this is the reason each product of ours is best in quality standards and preciseness. Additionally, we have hired expert quality controllers that hold good experience in tailoring & stitching domain. They work for us as per our norms and rules. From our side no delay will be made in the distribution of facilities. We own to fully-fledged infrastructural unit based in the prime location of Gurgoan, Haryana. Our unit premise is surrounded with the many big industries and it is nearby to roads & highways. We have maintained all the modern tools & equipment of embroidery so that we can execute all the work with perfection. Similarly, our product range is superior in quality standards because we only use quality raw components in the fabrication process.